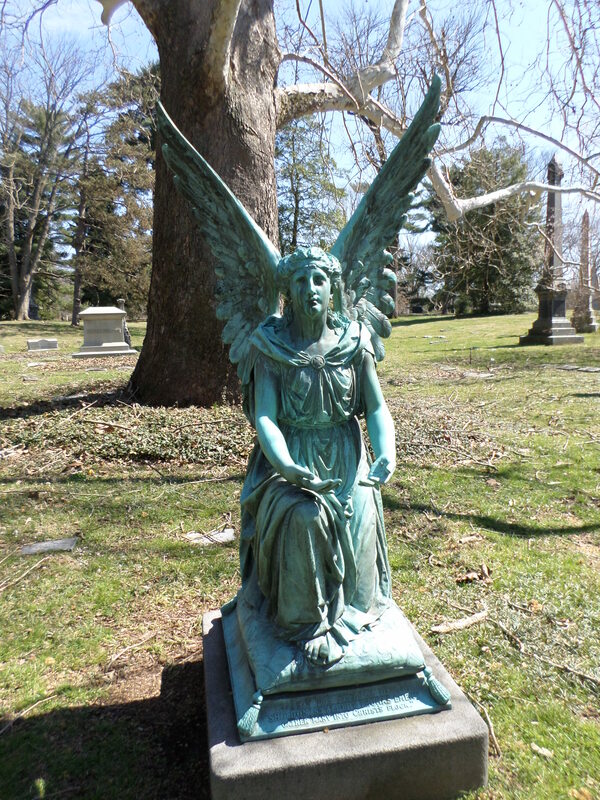 My first thought when I caught sight of this dramatic angel in Spring Grove Cemetery in Cincinnati was, ‘Don’t blink!’ Not sure how many of you are Dr. Who fans – but that’s all I could think about while looking at this statue. For a while I was mesmerized. Now that I’ve found out more about the two young men who died far too young, I’m overwhelmed with sadness at the early loss of life. Just a note on the Gracchi reference in the following obituary – the two brothers were Roman politicians in the 2nd century B.C. Sacred to the memory of Sheldon and Albert Thomas Emery. Gather many into Christ’s flock. Spring Grove Cemetery, Cincinnati, Hamilton County, Ohio. Sheldon and Albert Thomas Emery were sons of Thomas Josephus Emery and Mary Muhlenberg Hopkins, born in England and New York, respectively. They were married in 1864. Sheldon Emery was born March 18, 1867, in Turin, Italy. Albert Thomas Emery was born in Cincinnati, September 21, 1868. In the 1880 Hamilton County, Ohio, census, Thomas Emery, 48, was a dealer in real estate; Mary was 43, Sheldon 13 and Albert 11. Also living in the household was Mary’s mother, Mary Hopkins, 73; and Mary’s sister, Belle Hopkins, 31. In the 1890 census Sheldon is listed as a clerk, working for his father. Albert Thomas Emery died February 11, 1884, in Concord, New Hampshire, as the result of an accident while coasting. He was at school. Sheldon Emery died October 26, 1890, as a result of pneumonia. He was an alumnus of Harvard Law School. On Sunday, October 26, 1890, of double pneumonia, Sheldon Emery, son of Thomas J. and Mary M. Emery, in his 24th year. When the mother of the Gracchi was asked to display her jewels she answered, as she enveloped her two boys in her arms, ‘These are my jewels.’ In imitation of this noble Roman mother Mrs. Emery might thus have truly answered six years ago if asked to exhibit some token of her wealth. She, like the mother of the Gracchi, was the mother of two boys as bright and promising as were the Gracchi. Today her jewels are gone. The first perished in a coasting accident while at St. Paul’s School about six years ago; the other died last night at his home at Edgecliffe, Walnut Hills. The house is now left unto Mr. and Mrs. Emery desolate. Mr. Sheldon Emery, in whom both the father and mother had centered all their hopes, was but just developed into a mature man. He had scarcely rounded his twenty-fourth year. Of exemplary habits and endowed with the energy that has characterized his father and that distinguished his grandfather, he was big with promise. He had a powerful frame, symmetrical with a brain that had been cultivated by study and extensive reading. He was therefore fully equipped to engage successfully in the pursuits of which his father was master. Indeed, he had already begun to gradually assume a part of the great responsibilities with which the master was eager to entrust him. Is it any wonder, then, that the house is today desolate?